Today’s PyroElectro Tutorial: RS232 serial communication is widely used for transferring 8 bits of information at a time. The PIC gives us easy access to hardware that is capable of serial communication. 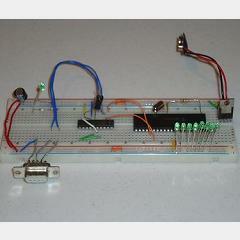 This tutorial shows you how to build a simple, but effective RS232 communication interface. Very great tutorial. Thank you so much. I still have question about how your operate on laptop. 1. What program you use on laptop to run your serial_interface.c code? 2. Do I need to compile the serial_interface.c code into PIC chip? 3. What is Good_Terminal.exe used for? If you can provide me some information that will be very appreciated.